In 2007, the Ontario Ministry of Health and Long-Term Care made an investment to support full-time employment for new graduate nurses. 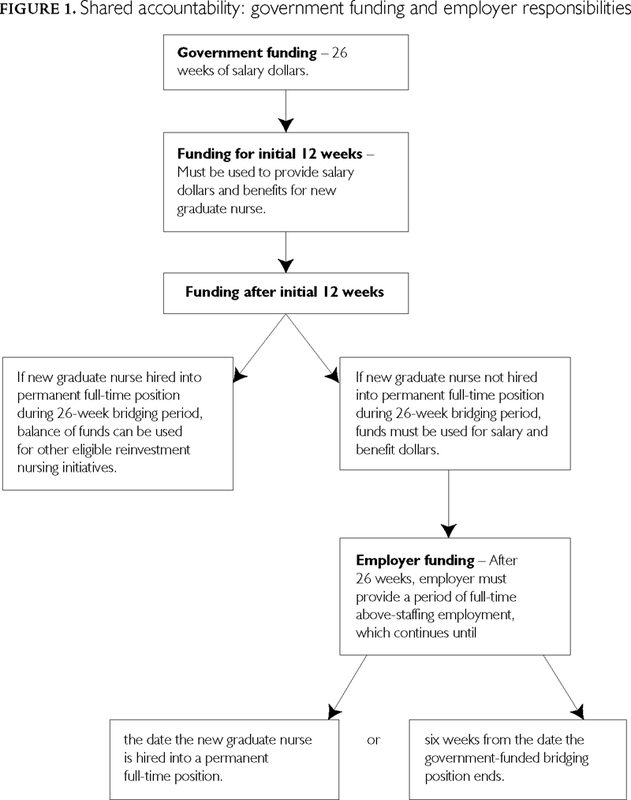 This paper describes the collaboration of policy makers and researchers in the creation and implementation of the Nursing Graduate Guarantee (NGG). We provide historical context for the development of the initiative and discuss some of the issues related to its implementation. Relevant stakeholders assisted researchers and policy makers in the creation, implementation and evaluation of the NGG. Researchers continue to work with policy makers in ongoing evaluations of the multi-year strategy, which are informed by stakeholder input. The Nursing Graduate Guarantee (NGG) was created and financed by the Ontario Ministry of Health and Long-Term Care (MOHLTC) and is one of the few evidence-based policies that have undergone long-term evaluation. This paper outlines the process that led to the development of the NGG in 2007. Results of a three-year study to evaluate the impact of the NGG on full-time (FT) employment and workforce integration of new graduate nurses (NGNs) in Ontario is presented in a companion paper, "Workforce Integration of New Graduate Nurses: Evaluation of a Health Human Resources Employment Policy" (Baumann et al. 2011). Historical context is provided in the current paper, and some of the issues related to implementation of the initiative are discussed: funding feasibility, FT employment parameters and equitable distribution across organizations, sectors and regions. Other important considerations include the impact of the collective agreement and the effect on mid- to late-career nurses. The NGG evolved out of collaboration between policy makers and researchers and received extensive input from nurses, employers and bargaining units. In September 1998, a provincial nursing task force was asked to "examine nursing services in Ontario, to identify how changes in the profession affected the delivery of healthcare services, and provide recommendations about how the province's health system could be improved through nursing services" (MOHLTC 1999: 2). A landmark report, Good Nursing, Good Health: An Investment for the 21st Century (MOHLTC 1999), highlighted a diminishing supply of registered nurses (RNs) and registered practical nurses (RPNs) in the healthcare system. The report also indicated there were not enough NGNs in FT positions to ensure an experienced nursing workforce in the future. The Nursing Secretariat was given the responsibility of implementing the nursing task force recommendations. The data that informed the work of the task force came from researchers. Since 1999, studies have shown that most NGNs want FT employment (Grinspun 2003; Blythe et al. 2005; Baumann et al. 2006). However, many nurses are unable to obtain FT positions (Baumann et al. 2006). Over a three-year period (2003–2006), the Ontario government invested in the provincial healthcare system to support the nursing profession by creating new FT nursing positions, increasing the number of FT nurses hired in hospitals and long-term care homes and converting casual and part-time nurses to FT employment. In May 2006, the MOHLTC announced the HealthForceOntario (HFO) strategy, a three-part health human resources plan to ensure that Ontario had the right supply and mix of healthcare professionals. The first part addressed new roles in high-need areas. The second part dealt with equipping the province to compete for healthcare professionals. The third part focused on building capacity and stabilizing the nursing workforce via the NGG (MOHLTC 2006, 2007a,b). By February 2007, the government committed to an $89-million investment to guarantee that up to 4,000 NGNs in Ontario would have the opportunity for FT employment (MOHLTC 2007b). Temporary FT employment was financed for up to six months, and extended orientation and mentorship were provided. Three distinct stakeholder engagement mechanisms were introduced to inform the design and implementation of the program. First, the government announced the NGG and established a task force in 2006 to develop strategies and provide recommendations on how to implement the program (Burkoski and Tepper, 2010). Second, the task force consulted with approximately 75 nursing leaders from different healthcare sectors about implementation strategies. Third, following its final report on implementation strategies, the government asked the task force to reconvene as a steering committee to provide advice and oversight to the NGG implementation process. Task force membership included employers, professional associations, a nursing regulatory body, researchers and representatives from two government ministries (health and education). Activities included reviewing data and modelling scenarios to determine the number of NGNs needed in the future; profiling healthcare sectors to better understand factors that affected their ability to create FT nursing jobs; consulting with chief nursing officers across the province; and examining information to inform the design of the NGG, including best practices. An environmental scan of programs in other provinces was also conducted to capitalize on the experiences of other jurisdictions. By the time the task force had concluded its work in October 2006, it had outlined six program features and recommended eight implementation strategies. Many of these components had been discussed with and vetted by stakeholders and were submitted with the knowledge they would support them. The task force recommendations were accepted and integrated into the design and implementation of the NGG. During the development process, the task force and stakeholders identified key issues in creating and implementing the NGG. These included funding feasibility, FT employment parameters, the impact of collective agreements and the effect on mid- to late-career nurses, and equitable distribution across organizations, sectors and regions. Thoughtful planning was required to ensure the model was suitable for healthcare organizations. The funding amount was calculated based on a six-month FT new nurse salary plus benefits. The wage was in accordance with collective agreements for new RNs and RPNs. An important aspect of the funding model was ensuring employer accountability in providing NGNs with a permanent FT position. The government provided funding for temporary FT supernumerary (above staff complement) positions for six months. 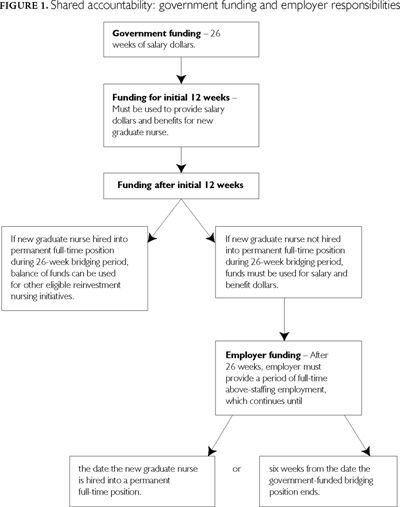 If a new graduate nurse was not offered a permanent FT position within six months, the employer needed to commit to funding an additional six weeks, providing a total of 7.5 months of FT work. Employers able to transition NGNs into a permanent FT position after three months but before six months were able to keep the remaining funds and use them for other eligible reinvestment initiatives. These included intraprofessional activities, preceptorship programs and the assimilation and transition of internationally educated nurses into the workforce. In addition, employers were required to sign an agreement before they received funding. The agreement outlined expectations for involvement in the NGG, including how the funds would be provided by the MOHLTC and the manner in which they were to be used by employers (see Figure 1). Initially, 80% of funds would be deposited following a signed funding agreement. The final 20% would be awarded once the government was satisfied the employer had met all reporting and accountability requirements. These included a signed funding agreement, completion of the final report and verification by collective bargaining representatives that the NGG had been implemented in consultation with the unions. Failure to obtain this verification would result in suspension of the final balance of payment until the requirement had been met. The parameters of FT employment were discussed during the development process. Stakeholders believed that the FT position offered through the NGG needed to support NGNs in transitioning from school to work. However, it also needed to benefit employers to encourage their participation in the initiative. Hence, the FT position was created as a temporary supernumerary position for up to six months, with an extended orientation and mentorship component. The latter was designed to ease the transition of NGNs into the workplace and support them in becoming fully engaged members of the healthcare team. Organizations provided a minimum of 12 weeks of orientation, including three to six days of general orientation. The roles of NGNs, mentors and orientation leaders were clarified. A learning plan was developed by mentors and NGNs and was used to support the new graduates and guide evaluation of their progress. Various teaching strategies were encouraged to facilitate the entry of NGNs into the work environment. Closely tied to the issue of FT work was the impact of collective agreements in offering FT employment to NGNs ahead of internal staff. It was important that the parameters of FT through the NGG were aligned with collective agreements across organizations to ensure mid-career nurses were not displaced because of the policy. If the NGG provided employers with incentive funding to hire NGNs into FT staff positions, internal staff with greater seniority could be overlooked in favour of the subsidized position. However, by making the position supernumerary, the possibility of employers' hiring NGNs directly into staff positions because of the government funding was averted. A second issue raised by union stakeholders was related to NGNs accruing seniority while in supernumerary positions. There was some concern that NGNs gained a competitive advantage when applying for internal positions because of their six months of FT work through the NGG. This issue was dealt with at an organizational rather than a policy level. Local agreements were negotiated to decide whether NGNs gained seniority while in their supernumerary positions. The intent of the NGG was to create a province-wide initiative that provided NGNs with the opportunity for FT work across all healthcare organizations, sectors and regions of Ontario. To ensure equitable distribution, stakeholders identified eligibility criteria for employer participation in the NGG. Employers had to (a) be healthcare organizations that employed nurses, (b) be funded by the government of Ontario for the provision of nursing services and (c) have the infrastructure to support successful implementation of the initiative (MOHLTC 2008). Hospitals had greater resources and capacity to hire new graduates through the NGG. Some long-term care facilities and community organizations had limited infrastructure to support the initiative and required more support in the implementation phases of the policy. In addition, healthcare organizations in rural and remote regions of Ontario were more limited in recruiting new graduates through the NGG. These issues were monitored throughout the implementation process, and policy adjustments were made to assist organizations in need. An innovative component of the NGG was a web-based employment portal that enabled online computer matching. HFO built the portal on the concept of a job search engine used for medical residents. In Ontario, there are 3,000 to 4,000 NGNs looking for FT positions every year and approximately 1,198 potential employers. Through secure online registration, employers could profile their organizations and advertise available positions, while NGNs could indicate their interest in obtaining these positions. Employers and NGNs could also outline their preferences, thus facilitating suitable matches. Employers interviewed according to their usual methods. An online-automated process was used to provide information about available positions, apply for NGG bridging positions, accept applications for new graduate positions, offer NGG positions and secure a suitable employment match. The MOHLTC launched a comprehensive marketing campaign to heighten awareness of the initiative. Ministry staff hosted a teleconference with nursing employers across the province. High-profile announcements and press releases were used to advertise the teleconference, and information pamphlets were distributed to key stakeholders and all schools of nursing. Based on historical data indicating the proportion of NGNs looking for FT employment, it was predicted that over 75% would participate in the NGG. Explicit guidelines were developed for employers and NGNs who wanted to participate. The guidelines, including the eligibility requirements and matching process, were documented in a publication and posted to HFO's website, making the information accessible to all interested organizations and nurses (MOHLTC 2007a). The initiative as outlined by the MOHLTC (2008) was designed to achieve several objectives. It was intended to provide NGNs with the opportunity for FT employment in Ontario and facilitate recruitment in all healthcare sectors. It also encouraged employers to create bridging positions and support the transition of NGNs into practice through orientation and mentoring. The overall outcome was that the NGG retained nursing graduates in the province and prevented them from seeking employment in other jurisdictions. Previously, researchers identified the critical issue of the increasing part-time and casual workforce. This led to the creation of the NGG. As the initiative was rolled out, it was decided that the impact of government intervention should be assessed. Beginning in 2007 and continuing in 2008 and 2009, implementation of each year of the program was evaluated through a triangulation design, which included surveys, focus groups and key informant interviews (Baumann et al. 2006, 2008, 2009). Based on the evaluations, the NGG is successful. However, the Nursing Secretariat continues to look for opportunities to enhance the initiative from both policy and administrative perspectives. Program and portal statistics are closely monitored, as are the government's fiscal realities and the healthcare environment in which the NGG operates. When significant findings arise, the NGG steering committee meets to review the information, share its expertise and provide advice and recommendations on program enhancements. To date, there have been improvements in the portal layout, instructions and searching and tracking capabilities. Program and policy enhancements have included strategies for increasing uptake in rural settings, in smaller organizations and for RPNs. The creation of policy initiatives using evidence is a model that can be used for other jurisdictions. The nursing workforce is the largest health human resource in Canada. Targeting policies to stabilize this workforce is essential to ensure a sustainable healthcare system. Policy makers should consider the following strategies in developing similar policy initiatives. First, use scientific research to develop policies tailored to meet specific provincial/territorial health human resource goals. Second, solicit stakeholder feedback prior to and during implementation of the initiative to ensure support and buy-in for the policy. Finally, conduct ongoing evaluation of the policy through a rigorous research design. This strategy allows the policy to evolve based on evidence about what is needed by and is feasible for stakeholders. En 2007, le ministère de la Santé et des Soins de longue durée de l'Ontario investissait dans une initiative d'appui pour l'embauche à temps plein de nouveaux diplômés en soins infirmiers. Cet article décrit la collaboration entre les responsables de politiques et les chercheurs dans l'élaboration et la mise en œuvre de la Garantie d'emploi pour les diplômés en soins infirmiers. Nous présentons le contexte historique qui a mené au développement de l'initiative et nous discutons certains des enjeux liés à sa mise en œuvre. Des intervenants pertinents ont aidé les responsables de politiques et les chercheurs dans la création, la mise en œuvre et l'évaluation de la Garantie. De concert avec les responsables de politiques, les chercheurs effectuent des évaluations continues de la stratégie, lesquelles sont informées par les commentaires des intervenants. Correspondence may be directed to: Vanessa Burkoski, DHA, Vice President, Professional Practice and Chief Nursing Executive, London Health Sciences Centre, 800 Commissioners Road East, POB 5010, London, ON N6A 5W9; tel. : 519-685-8042; fax: 519-685-8127; e-mail: vanessa.burkoski@lhsc.on.ca. Baumann, A., J. Blythe, K. Cleverley and D. Grinspun. 2006. Health Human Resource Series Number 2. Educated and Underemployed: The Paradox for Nursing Graduands. Hamilton, ON: Nursing Health Services Research Unit, McMaster University. Baumann, A., M. Hunsberger, D. Idriss, M. Alameddine and D. Grinspun. 2008. Health Human Resource Series Number 10. Employment of Nursing Graduates: Evaluation of a Provincial Policy Strategy. Hamilton, ON: Nursing Health Services Research Unit, McMaster University. Baumann, A., M. Hunsberger, D. Idriss-Wheeler and M. Crea-Arsenio. 2009. Health Human Resource Series Number 19. Employment Integration of Nursing Graduates: Evaluation of a Provincial Policy Strategy Nursing Graduate Guarantee 2008–2009. Hamilton, ON: Nursing Health Services Research Unit, McMaster University. Baumann, A., M. Hunsberger and M. Crea-Arsenio. 2011. "Workforce Integration of New Graduate Nurses: Evaluation of a Health Human Resources Employment Policy." Healthare Policy 7(2): 47–59. Blythe, J., A. Baumann, I. Zeytinoglu, M. Denton and A. Higgins. 2005. "Full-Time or Part-Time Work in Nursing: Preferences, Tradeoffs and Choices." Healthcare Quarterly 8(3): 69–77. Burkoski, V. and J. Tepper. 2010. "The Demonstration Projects: Creating the Capacity for Nursing Health Human Resource Planning in Ontario's Healthcare Organizations." Canadian Journal of Nursing Leadership 23(Special Issue): 8–17. Grinspun, D. 2003. "Part-Time and Casual Nursing Work: The Perils of Health-Care Restructuring." International Journal of Sociology and Social Policy 23(8/9): 54–70. Ministry of Health and Long-Term Care (MOHLTC). 1999. Good Nursing, Good Health: An Investment for the 21st Century – Introduction: About This Report. Retrieved October 9, 2011. <http://www.health.gov.on.ca/english/public/pub/ministry_reports/nurserep99/nurse_rep.html>. Ministry of Health and Long-Term Care (MOHLTC). 2006. "McGuinty Government Invests in Nurses." News release. Retrieved October 9, 2011. <http://www.health.gov.on.ca/english/media/news_releases/archives/nr_06/jan/bg_012606.pdf>. Ministry of Health and Long-Term Care (MOHLTC). 2007a. "Guidelines for Participation in the Nursing Graduate Guarantee." Retrieved October 9, 2011. <http://www.healthforceontario.ca/upload/en/homepage/ngg%20posted%20revised%20guidelines%20-%20august%208.pdf>. Ministry of Health and Long-Term Care (MOHLTC). 2007b. "McGuinty Government Offers Full-Time Job Opportunity for Every Ontario Nursing Graduate." News release. Retrieved October 9, 2011. <http://www.health.gov.on.ca/english/media/news_releases/archives/nr_07/feb/nursing_graduate_nr_13_20070226.html>. Ministry of Health and Long-Term Care (MOHLTC). 2008. "Nursing Graduate Guarantee 86 per cent of Participants Gain Full Time Employment – 1st Anniversary Results Reverse Historic Trend." News release.Retrieved October 24, 2011. <http://www.health.gov.on.ca/english/media/news_releases/archives/nr_08/mar/nr_20080306.html>.